Ahhhh! It's here! It's here!!!! It's finally the Christmas season and this girl couldn't be happier! Like most people, it's my favorite time of the year and I get super giddy about all things Christmas (especially decorating). 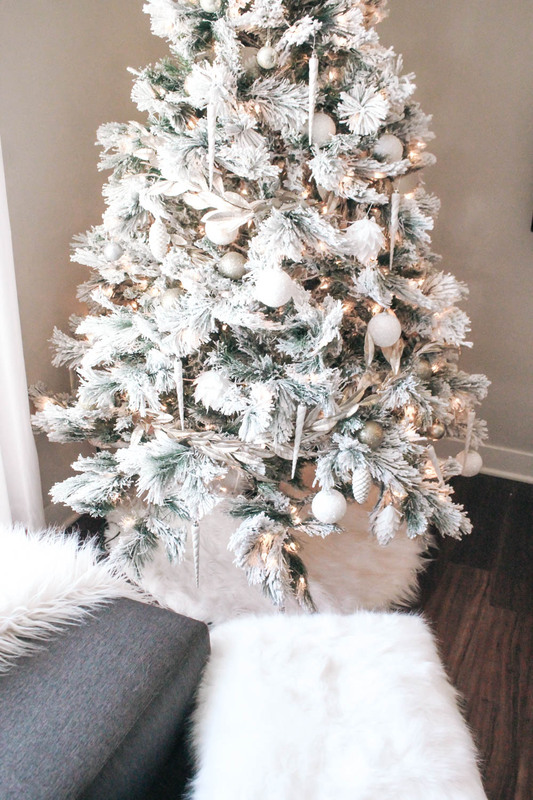 Today I'm sharing my Christmas decor that I've looooving. Everything just feels 1000x more cozy and festive once the Christmas decor is up! Currently typing this blog post with The Holiday on TV and my Christmas tree glowing in the background. So this year I was going for a super white and gold, ethereal, yet classic vibe with the decor. 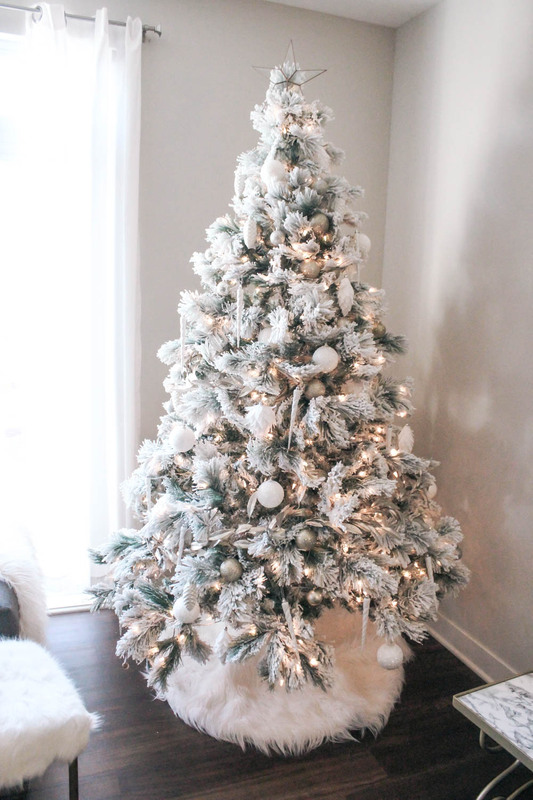 I was so back and forth between an all white tree or a flocked tree. I decided to go for a flocked tree and I am so happy. I have a small apartment, so I was a little bit worried about the size of the tree (last year my tree was pretty dinky) but I decided to just go for it! It's only Christmas once a year, so might as well go all out!! All of my Christmas decor is from At Home. You guys know I love their massive assortment and incredible prices. I was seriously like a kid in a candy store when I went to pick out my decor.. so giddy. They have all of their ornaments and decor for Christmas categorized by style. 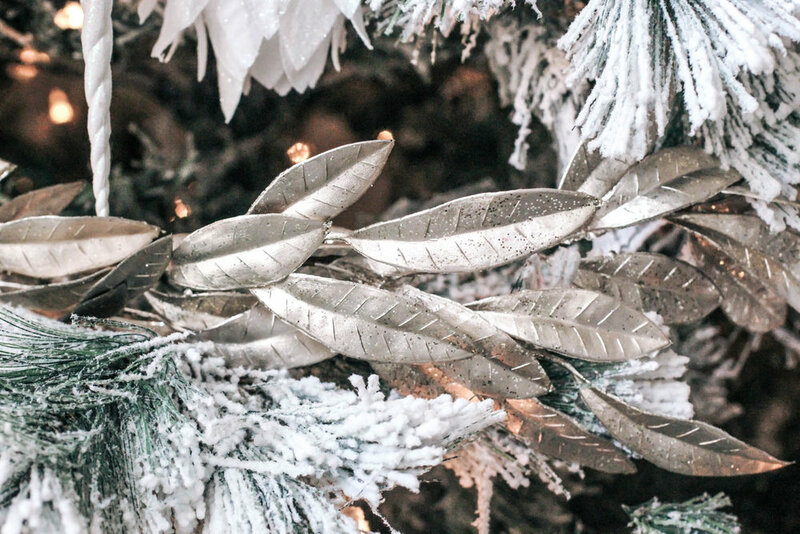 Some of my favorite styles were Lavish Luxe, Wild and Free, Jeweled Frost, and Ethereal Season. It made it super easy to pick out ornaments when you could easily find similar styles. I trimmed my tree with glittery white icicles, pine cones, and feathers. I also added some sparkly gold leaves for a little touch of glam. I'm so happy with how it all turned out. It's the kind of tree I've been Pinning for about a year now and I finally get to enjoy it in my little home. 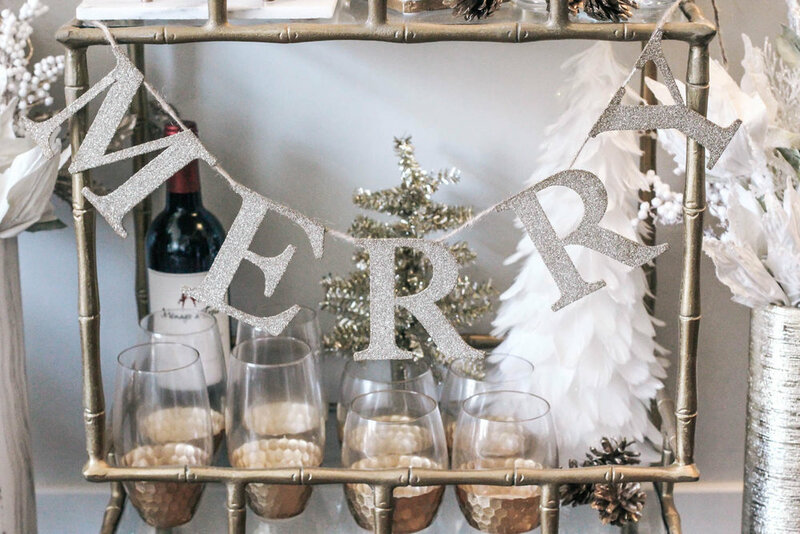 Oh- I also added a few holiday accessories to the bar cart! A couple white Christmas and a glittery reindeer quickly transformed the cart. I've had so much fun switching it up with every season (you can see the other looks here and here)! 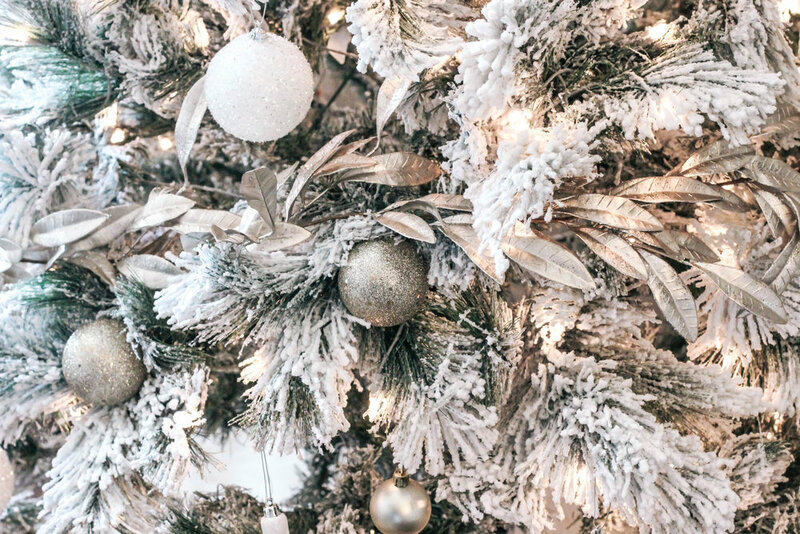 Okay guys- I'm going to get back to my Christmas movie and enjoying my cozy decor but I've linked a few items below and everything can be found in an At Home store near you. Happy start to the holiday season!!! This post was sponsored by At Home. All opinions and text are my own!